The Neuromatrix theory seeks to understand the nature of pain and how it is created and perceived in the brain. Dr. Tim Salomons is interested in the cognitive and biological mechanisms that make pain salient and how individual differences in these mechanisms might underlie differences in coping and treatment response. His work aims to understand how the brain and body interact to create the experience of pain, and why some people might be prone to develop pain while others are relatively resilient. He’s especially interested in the biological mechanisms that underlie cognitive and affective responses to pain and how this knowledge might help us treat pain. If you have been following along with the evolution of the Healing Pain Podcast, you probably have noticed that almost every speaker who is up to date on the latest pain signs mentions in one way or another what we call the brain and pain. This is such an important topic that many researchers have devoted their entire career to exploring and learning more about what happens inside the brain when chronic pain develops and persists. Even though there is no one area for pain in the brain, neuroscientists have been able to recognize some key brain structures involved in the various components of the pain process, and this is what is known as the pain neuromatrix. The concept of the pain neuromatrix was first coined by a Canadian psychologist by the name of Ronald Melzack in the late 1980’s in an attempt to explain the strange but very common phenomenon of what’s called phantom limb pain. Phantom limb pain is the experience in which people who have had a limb amputated feel the very real sensation that there’s pain coming from a limb that is no longer there. This phenomenon clearly shows that pain is not generated by a one-way system in the body. Pain Neuroscience has shown us that the activity of this pain network is highly sensitive to what is known as a top-down process which explains why cognitive interventions help with pain, but this pain neuromatrix is also influenced and highly sensitive to what is known as bottom-up systems such as manual therapy techniques or the various types of movement therapies. The layman’s term for these top-down and bottom-up type approaches are simply what is known as mind-body therapies. You will meet an expert in the neuroscience of pain, especially with regard to the pain neuromatrix, and his name is Dr. Timothy Salomons, who is an associate professor of psychology and neuroscience at the University of Reading in the United Kingdom. Dr. Salomons studies both the cognitive and biological mechanisms of pain, how individual differences in pain mechanisms might underlie one’s ability to cope with pain, and how they affect the overall treatment response. In this episode, you will learn all about the pain neuromatrix and how neuromatrix informs modern pain care, how progress in neuroimaging is advancing pain medicine, but why it may not be the end-all and be-all with regard to the study of pain. How one’s emotional response to pain may be at the center of reversing this chronic pain trend. If you’re new to the Healing Pain Podcast community, I extend a very warm welcome. Make sure to subscribe to the weekly newsletter by going to www.DrJoeTatta.com/Podcast so I can send you the latest interview right to your inbox each week. 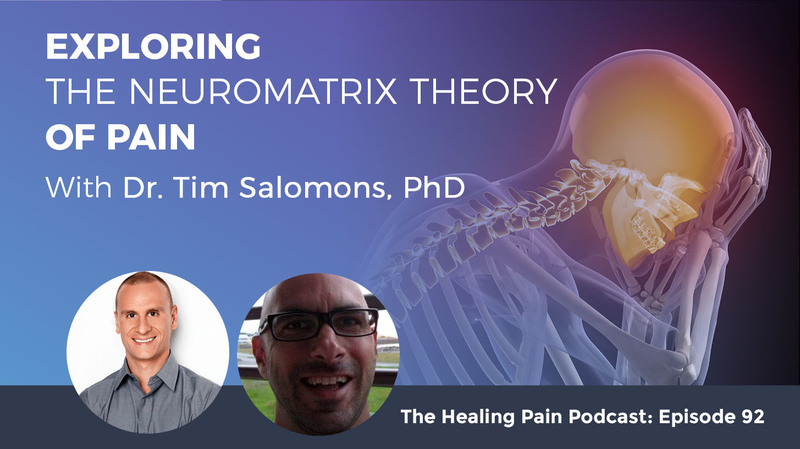 Without further delay, let’s dive into the pain or a neuromatrix with Dr. Tim Salomons. Tim, I look at your bio, which is quite long and obviously you’ve done a lot of work in pain research and pain neuroscience. Can you tell everyone how you became interested in researching pain, because believe it or not, around the world, we don’t have too many pain researchers like yourself. That’s particularly true in psychology. I’m surprised that actually more psychologists aren’t interested in pain because if you’re interested in any kind of mind-body question, pain is about your perfect example of that, which I took a long route to discover that. I had a couple of years out post college. I decided to go back to school and I thought at that time I’d like to become a clinical psychologist. A good way to start into that was I’ve got a job working as a coordinator on a study of posttraumatic stress, which I was very interested in. It was a fascinating phenomenon. The person I was working with, Dr. Peter Stenn in Toronto, had a very interesting idea. That was that some people who have been through traumatic circumstances, if they experienced pain as part of their trauma, they might re-experience that as a flashback. I thought that was an interesting idea because it suggests some memory mechanism for pain. I started to write a paper on that and it turned out one of the world’s experts on things like phantom limb pain lived in Toronto also. His name was Joel Katz. He had written quite a few papers and I emailed or probably at the time phoned him and he was very interested in this and he actually offered me a full-time position and I started working with him. As I got into doing that, all of the fascinating aspects of pain started to unravel themselves for me. Before long, I was no longer all that interested in posttraumatic stress and I’ve been a pain researcher ever since. I did end up as a clinical psychologist. That I stuck with. When doing research on something, there’s nothing like seeing actual patients to ensure the questions you’re asking are the right questions. Did you treat pain patients as a clinical psychologist? All of us are seeing pain in one way or another. Was that a focus of your practice? It was my research focus. In training, I would look for instances or I would send all the pain patients to me. For example, as part of my training, I worked in a maximum-security prison and I started a pain group there. I found it a great way, if you’re doing research on something, there’s nothing like seeing actual patients to ensure that the questions you’re asking are the right questions and to learn about new phenomenon that you may then go on to study. I always look for that. You’re the first person I’ve ever heard say that you’ve worked in a jail with people with pain. What was that experience like? As you probably know, one of the biggest problems in people with pain is they don’t get enough exercise. Their pain is telling them basically, “Sit still. Don’t do anything to active.” You can imagine how easy that is to do in prison. The other thing that we know really influences pain is negative emotions. They’re quite prone to pain and it’s a big problem. Approaching it as a psychologist and saying, “Pain is telling you this, but maybe the best way to treat it as that, and your negative thoughts and feelings are playing a role and maybe we need to investigate that.” There was a receptive audience for that. It sounds like a challenging environment. You’ve been doing research now for a while, when you look at the field of pain science and pain neuroscience, what kind of challenges do you see to studying and addressing pain more effectively? Something that I’ve become more interested in is the idea of individual differences. When you’re doing research, quite often you treat individual differences as noise. You just want to say, “How do men differ from women in terms of their pain processing?” or a question like that. You’re not looking for how the men within the group are different or how the women were in the group. 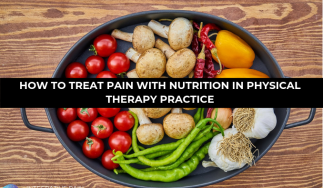 Something that I’ve been very interested in is how we can characterize people who are especially prone to pain because one thing that’s frustrating for patients and clinicians alike is how frequently unsuccessful we are at treating chronic long-term pain. One of the reasons for that is perhaps we’re not getting it early enough. We’re not asking ourselves who are the people who are at the most risk of developing chronic pain and what can we do if we know why they’re at risk? What can we do about it? How do we intervene on those? I’ve become interested in individual differences because I feel like it might be a key to taking a more proactive approach to the problem. Right now, we’re treating the problem often reactively after the cycle of negative emotion and pain has begun to set in. Where I think that could be especially helpful is in generating hypotheses. The gold standard should still be larger studies where we say, “Is this one case study I’ve seen just an anomaly or is the relationship I recognize in this person something that I’m going to see in other people?” In these case studies we can say, “For this person, it seemed that we’re especially sensitive to pain even before the chronic pain. Is that something we can type? Is that something we can characterize?” Once you formulate your question, then you want to look at 100 people or 200 people. As this podcast grows and of course other podcasts and blogs, people are starting to pick up and are starting to grasp the notion that pain comes from the brain and not necessarily the body. With that, they’re starting to hear things like pain neurosignatures and the pain neuromatrix. Can you explain what the pain neuromatrix is? What’s the best evidence of it? How it can inform a clinician’s practice? There’s a controversy around that. It’s a terrific question and it’s one that I’ve been spending a lot of time on because obviously if you’re like me and you do neuroimaging and you’re interested in the brain and you believe that the brain plays a fundamental role in pain, the first thing you’re looking for is, “Can we actually recognize pain when we see it in the brain?” What has driven a lot of this is that often we struggle with whether we can trust subjective reports because sometimes people are looking for medications or they may have many reasons not to be forthright with their pain ratings. Everyone is always saying, I wish we had an objective measure. We went about ten, fifteen years running these pain studies and we got what we called the pain matrix. It was a pattern of activation that no matter what pain imaging study you run, you see the same pattern of activation. Not to bore your audience with your long list of brain regions, but regions like the anterior cingulate cortex, the insula, the thalamus. If you don’t see these regions into pain imaging study, you’re probably doing something wrong. People started to think, “Maybe this is the objective marker we’ve been looking for.” We’ll have one of these things in every doctor’s office and we can do this in legal settings. What we’ve actually found, as much as I’d like to say that neuroimaging has sold every problem because it would certainly benefit my work in terms of funding, but what we’ve actually found is what we thought was the pain matrix or maybe a specific signature for pain turned out to not be as specific as we thought. We’re seeing actually similar patterns of activation, for example when people see really bright lights, when they hear really loud noises. Then I ran a study where we actually found some people who are congenitally unable to feel pain. They’re born without the ability to feel pain and we brought them in and we poke them with a sharp stick. Most people will find this as painful and they said, “We feel it. I can feel it very strongly,” and they would rate the sensation as high as healthy controls, but the healthy controls set, it’s painful. The people unable to feel pain said it’s not painful. We found robust pain matrix activation and that says to us that just because you see this pain matrix activation doesn’t mean the person’s in pain. To me that says, “At least this pain matrix is probably not a good indicator. We shouldn’t be using it to discount what people tell us.” If a patient says they’re in pain, I’m not sure we should be showing people the pain matrix to say that they’re not. For instance, using the example of a really bright light or very loud sound, you would see the same regions of the brain light up as when someone had pain. I guess that begs to be asked the question, is the brain just starting to register that some activity is happening but it’s not yet sufficient to produce the pain? When we see results like this, one of the possibilities we have to consider is that way back in the day, Descartes said that the brain is just a bell is rung by the body. That would be one interpretation of this, that basically the body is sending a signal saying, “Pay attention,” and the brain is, “I’m paying attention now.” I suspect, my intuition is that it’s not that. The brain plays a more fundamental role and in fact we know that because we know the brain also sends signals down to the spinal cord to alter the pain signals. We know that the brain is an active player. The question is whether there are specific regions of the brain that specifically produce pain. That’s a bit more of an open question. There is something in the central nervous system, the spinal cord and the brain, that is driving people to be extra sensitive to pain. Tor Wager in Colorado is doing some excellent work using machine learning to hone in on a more specific signature. He’s certainly done better than the old pain matrix. With that said, we don’t necessarily know that the regions that are distinguishing pain from not pain are actually creating the pain. There’s still a lot of work to go, but I’ve recently started collaborating with philosophers because one of the questions we’re jointly interested in is how do the body and brain get together to make this experience? What is the exact relationship? Some people, it’s become maybe common wisdom to now say pain is all from the brain. On the other hand, when we see these people with congenital analgesia, their disorder is actually one of nociceptors, which are the fibers that usually result in pain. Their problem is in the body. That suggests that the body certainly can’t be disregarded. It’s playing an active role. The question is how are the brain and body working together to make this? Essentially that’s why I like your work because as a psychologist and there are pain psychologists who study pain, most of their work focuses around emotions, affect and learning. Those are magnificent topics that we need to explore more, but your work still brings the body into it, which I find interesting. The way I read your research, it’s almost like, “We can talk about this top-down thoughts and emotions, but we also have to talk about what’s coming up from the bottom. Can you talk about that a little bit more and why both are important? As I said, when these nociceptors aren’t working, people don’t have pain at all. For people who are unfamiliar, this is just a receptor that seems to respond specifically to things that could potentially damage us, like really hot heat or chemical burns or these things. We know that if you never have these, that you generally don’t have pain. On the other hand, we have lots of pain where we have no evidence of nociceptors firing or anything like that. Melzack and Wall were really the grandparents of our field. They talk about a variable link between pain and injury. We have lots of instances of people having an injury without pain and we have lots of instances of people having pain without any apparent injury. What this says to me is that pain is some relationship between the body and the brain. We can’t study one and think we’ve got the entire picture. To me it’s how are they talking together, what sorts of relationships are we seeing, how can we understand how that interaction is working? I was just talking earlier about whether or not we’ve seen specific receptors in the brain. We’re also talking about specificity in the body and how specific are the different levels of the neural axis, to the pain experience. When you say levels of interactions, meaning if I have a receptor in my finger that goes up my arm, it goes into my spinal cord, that’s one level. Then maybe the brainstem is another level, the different parts of the cortex are other levels. All of the wiring in between those two because we can have issues in nerves as well, neuropathic pain. Rather than looking at the brain per se, we could be looking for abnormalities or sensitivities at almost any level. As a psychologist, I’m particularly interested in things like central sensitization where there is something in the central nervous system, the spinal cord and/or the brain that is driving people to be extra sensitive to pain. The reason I’m particularly interested in that is mechanistically we see a real interaction between the central sensitization and our thoughts and feelings. I’m interested in what other psychologists are interested in, which are thoughts and feelings, but I want to know how are these thoughts and feelings interacting with the body and with how we experience stimuli that are occurring in our body. That brings me to so many other questions I want to ask you. I’m going to ask you a question that if I ask that the average physical therapists, they would have a very clear response. As a psychologist, this is maybe a little bit of a loaded question, but does your intuition tell you that someone can overcome pain without moving or exercising? My intuition is that there is no one level. Oftentimes, the problem is that we are attempting to solve the problem at one level. As a psychologist, we’re always drawn to these images where a monk is walking across hot coals and he’s completely mentally overcome the pain. Do I think it’s possible that we can do it without exercise? Theoretically, yes, but in practical terms I would say why one or the other? We know exercise is good, and sometimes the best combination of treatment is if I am working with somebody to overcome the psychological issues that are keeping them from exercising. The exercise issue is a huge one psychologically as well. Normally what pain tells us, if I touch a hot stove, my pain tells me don’t touch that hot stove again. Chronic pain is a bit of a different case. If I have lower back pain, normally pain tells me, “Don’t move, just sit still and don’t do that.” With chronic pain, we know that if people listen to that urge and don’t move, there’s going to be a problem. My intuition would be why one or the other? Let’s do both. Let’s use psychology to get them to exercise and let’s use exercise to help them with the psychological issues because we also know exercise makes you feel good mentally. I’m sitting on the fence a little on that one. Conversely, why should a physical therapist or anyone in the “non-psychology fields,” why should they start to become more aware of emotions in the body and how potentially it informs their patient’s pain? Let me give you a good example. Let’s say as a physical therapist, I see somebody with a degenerative condition. I know if I want to keep this person functioning maximally, they need to do a particular type of exercise. I’m trying to stop this degenerative process or slow it. I say go home and for 45 minutes every night I want you to do this exercise. If you do that, your pain will get worse. Think of that in terms of learning. Basically, what the patient is learning is if I do a whole bunch of work, nothing is going to happen. You can imagine that might not be something that they repeat. Skinner will tell you that something that’s not rewarded is not going to get repeated and the patient is perceiving that as a lack of reward. One unconventional way a psychologist can help is to point that out. Here is how people learn. They learn by being rewarded and if you want them to continue this behavior, we need to set up some type of reward schedule, for example, or at very least we have to make them aware what to expect. This is the expectation routine that’s going on in this person’s mind. They think if I do something for 45 minutes every night, I’m going to get a benefit, and in fact, the only benefit is lack of degeneration. Even if somebody rejects traditional psychological ideas about how our thoughts and feelings play into pain, even getting people to adhere and to help. One of the biggest problems we have in pain management, in my opinion, is poor expectation management. 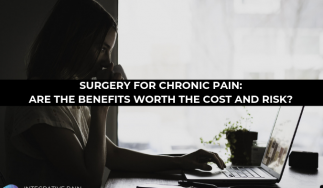 You’ve probably seen as have I patients who are scheduled for a back surgery for example. You see the kind of hope that they invest in these back surgeries. They believe, “Finally, somebody is going to cut away whatever problem is ailing me.” More times than not, these back surgeries fail. Imagine what that feels like. Imagine how much hope and expectation you have poured into this? You don’t have to believe anything about the power of traditional psychological treatments to understand that that person is now way worse than they were before because after that, you told them anything that will help and they’ve got to be skeptical. If someone’s skeptical, they’re not buying in and they’re not going to complete your treatment. Choosing the right strategy for the right instance seems to be the ultimate adaptive strategy. In so many ways, we’ve created this hopelessness space for patients. That feeds into their pain more and more. As a psychologist, when we talk about the cognitive function of the brain, all the different cognitive processes, is there one that particularly interests you to study further? Actually, you set this up very well because you just spoke about hopelessness. I’m especially interested in perceived control, the degree to which people feel that they have control. Here’s why this feeds into this hopelessness idea. Way back in the ‘60s, people did experiments called learned helplessness experiments. Basically, what you do is you give to groups of animals exactly the same stressors, whether they’re shocks or whatever, but one set of animals has the ability to escape those shocks and the other doesn’t. What they find is even though those two groups of animals have had exactly the same set of shocks or stressors, the group that has no way to control their outcome stops trying, they become demotivated. They show signs of anxiety and depression. Most importantly, they failed to learn in the next instance. If you then put them in a setting where they can control the stress, they don’t bother. What learned helplessness is it is a loss of the link between your actions and your outcomes. You no longer believe your actions have any effect on what happens to you. The reason that this is important is because a lot of our chronic pain patients are like this. A lot of chronic pain patients, let’s say they’ve had ten different drug trials, they’ve tried physio, they’ve been to a psychologist, they’ve been to fourteen different GPs and they still have pain. You can compare that to the learned helplessness trial. They have tried and tried and tried to escape their pain and failed and failed and failed. We wonder, why are they all depressed? Why are they not trying at the next treatment? Essentially, I would put to you that they have become learned helplessness exemplars. The ones who seem to do well both from the brain activation and from their ratings, seem to be the ones that when pain is uncontrollable, they switched to an emotion-focused strategy. That to me is interesting. In life, some things are going to be uncontrollable and some things will be controllable. Choosing the right strategy for the right instance seems to me the ultimate adaptive strategy. I’ve been very interested in this concept of perceived control and how it factors into their pain processing, their emotional state and also how their brain process has been. It sounds like some of the neuroimaging that you and your lab were doing could inform things like mindfulness and acceptance and commitment therapy that focus on those types of strategies versus some of the more CBT’s a little bit more like, “Let’s challenge this thought and let’s see if we can change the thought or reframe the thought,” which oftentimes does not work for patients. In my brief time treating pain patients, part of your trick was to find them a solution that worked for them. Even though I’m an advocate and I do a lot of studies of CBT, but there’s a reason academics like CBT. What you’re doing in CBT is you’re saying let’s examine the evidence and let’s examine our thoughts. We sit around and think all the time and look at evidence, so this appeals to us. Frankly, when I would sit there with a lot of patients, I’d say, “When that came up, what thoughts were you having?” They’d give you this blank stare like, “What are you talking about? My thoughts don’t telegraph across my brain. You’re talking nonsense.” Whereas if you say, what emotions did you feel? Was there a reason for that? Could we make it so that you don’t react in that same emotional way? Then many of them, all of a sudden you see the light switch on and they say, “I know.” You’re framing it in a way that I understand. That’s often the trick. I would say the two tricks are to find something that works for an individual and to help that individual learn which are the uncontrollable events and which are the controllable events. An emotion-focused strategy isn’t always right. The example I often give is we can have two people in traffic and one of them is freaking out trying to get past the traffic. There is no action-focused strategy that’s stupid. Your best bet is to just calm down and listen to the radio and just try to wait it out. If, however, before you left home you looked at Google maps and saw a huge traffic jam, you’d be a fool to adapt an emotion-focused strategy and say, “I’ll take the lousy route and I’ll just play my radio.” You’re going to be late to work. The best strategy is actually taking the action-focused strategy and say, “I’m going to take another route.” The two tricks are basically to trying to teach people which events are controllable and which aren’t, and to teach them strategies that are actually effective for them and fit in, that they believed them and they can do them. No one on the podcast has really framed it that way. A lot of people will enjoy that. 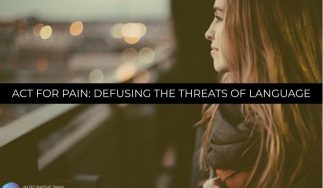 How has studying pain impacted how you personally experience pain? Certain things sound good on paper and then when you try to put them into practice, they’re a little bit different. Since you are starting to consultant and work with philosophers, how has studying pain impacted how you viewed the greater world? Maybe the best way for me to put it in terms of studying pain is we have one particular collaboration going on in which we’re trying to figure out whether people see pain as a thing in the body or the mind. For example, there’s a conjoined twins who share the same leg. With their shared leg they kick the same stone. One of them says, “Ouch.” The other doesn’t state anything. Which one of them is in pain? We want to know, does the general public think of pain as that experience in the foot or do they think of it as the mental experience? If they thought of it as the foot, they would say both of these guys are feeling pain, one is stating it, but the other is feeling it. Conversely, if they say only the person who says, “Ouch,” was feeling the pain, then they think of it as the brain. In terms of thinking about the public and thinking more everyday type of stuff, what this collaboration has showed me is that what we dream up in the ivory tower, we may have solved that issue. We haven’t. Let’s say we have solved that issue in the academics and research, that doesn’t mean it’s made it through to the public. The public may still be treating it as purely a product of the foot. If I don’t see an injury in you, if I don’t see you limping, if I don’t see scar tissue or something and you tell me you’re in pain, it’s not there. One thing it’s taught me is that we as academics or clinicians, let’s not assume that what we think and know jives with what the public thinks and knows. I’m trying a lot harder to listen to what people are telling me rather than just assuming that, because I’ve spent X number of years doing this, that I must know. There’s a big gap between what’s hitting the general public between those who stay up-to-date on some pain science, which is just moving so rapidly. It’s almost impossible to say. You have to be in PubMed everyday reading things. The type of thing you’re doing, Joe, whenever I’m able to do something like this, I do it for very reason because the type of thing you’re doing where you’re trying to bring science out to the general public and get it around, there’s so much bad information going around that the harder we can try to get the good information out there that we are. I certainly take every opportunity like this that I can. Thank you. I appreciate those kind words. I’ve been talking to Timothy Salomons. He is a psychologist and a pain researcher at the University of Reading in the UK. Tim, thanks for joining us and please let everyone know how they can learn more about you and your lab and all the great research you have going on. You can also find me on Twitter, @Head_Like_Egg. I’m always happy to interact with people by Twitter or by email or anything. I’m always interested in hearing people’s stories and giving them easy access to my research where I can. At the end of every episode, I asked you to share this information out with your friends and family on Twitter, Facebook, LinkedIn whatever your favorite social media is. Make sure you hop onto DrJoeTatta.com/Podcast and sign up for the newsletter so you can receive a new podcast each week directly into your inbox. Thank you and we’ll see you all. Dr. Tim Salomons is Associate Professor of Psychology and Neuroscience at the University of Reading in the UK. Tim is interested in the cognitive and biological mechanisms that make pain salient and how individual differences in these mechanisms might underlie differences in coping and treatment response. His work aims to understand how the brain and body interact to create the experience of pain, and why some people might be prone to develop pain while others are relatively resilient. He’s especially interested in the biological mechanisms that underlie cognitive and affective responses to pain and how this knowledge might help us treat pain.